With the United States Post Office's Forever Stamps, you can use them to mail First Class letters no matter what the current postal rate is. The current cost (2014) to mail a First Class letter is $0.49 but if you purchased Forever Stamps the year before (at a lower rate), you may still use those stamps to mail your letter today without adding additional postage. 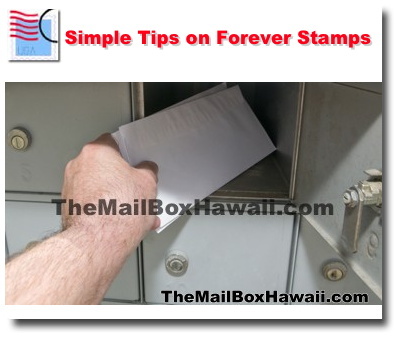 Forever Stamps are ideal for mailing normal-sized (one ounce) letters within the United States. For international mailing, check out the Global Forever Stamp, currently available for $1.10 per piece. If your letter weighs more than one ounce, be sure to weigh it before affixing a Forever Stamp to avoid being returned due to lack of postage. Here's a tip, if you are mailing heavier mail, avoid placing two Forever Stamps on a mail piece. Additional ounces may be cheaper at $0.21 per additional ounce rather than $0.49 for one ounce letter.